Trump may put 5 military officers in top posts. That’s unprecedented. President-elect Donald Trump is, apparently, partial to former generals and admirals. Several have been floated as possible nominees for cabinet and national security jobs. In addition to appointing Army Lt. Gen. Michael Flynn to be national security adviser, Trump appears likely to select Gen. James Mattis (USMC) as secretary of defense; is reportedly considering Gen. John Kelly (USMC) for secretary of homeland security, Gen. David Petraeus for secretary of state and Adm. Michael Rogers for director of national intelligence. Of course, other presidents have included a former high-ranking military officer in the cabinet. President George W. Bush’s secretary of state was Colin Powell, a retired four-star Army general and former chair of the Joint Chiefs of Staff. But the number and placement of these former military officers is unprecedented, as I’ll explain below. The United States, like most advanced democracies, has historically kept a relatively clear line between the civilian command that gives orders and the military that follows them. In fact, having three or four former high-ranking military officers in the top ranks of the administration would put the U.S. in the company of non-democracies like Thailand or Zimbabwe. Most healthy democracies — whether that’s Australia, Canada, Germany, or the United Kingdom — keep the military and civilian worlds quite separate. At most, advanced democracies may have one or two military officers in top jobs in the executive branch. Most democracies have none. But autocracies are different. My research examines when and where retired and active-duty military officers serve in national cabinets and state councils around the world. What I’ve found is that the patterns are quite different in democracies and non-democracies. 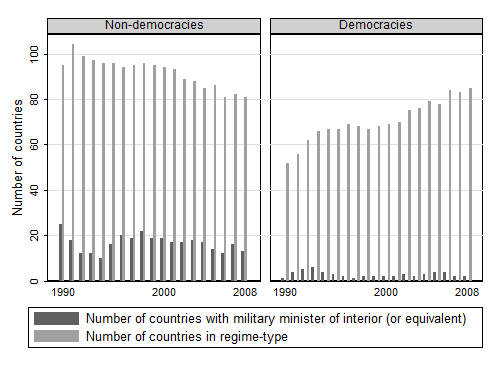 The figure below shows the average number of military officers (both retired and active duty) in national cabinets and state councils from 1990-2008 for democracies and non-democracies across the globe. As you can see, the difference is striking. 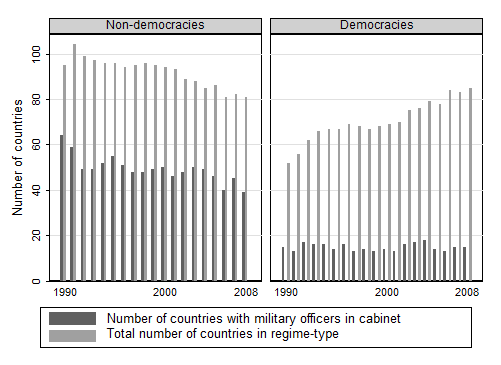 The average number of military officers in nondemocratic governments’ cabinets generally ranges between 1½ and two officers, while the average number for democracies is always well below a single officer. In non-democracies, the military often acts as either as the dictator’s informal partner or as an autonomous political faction — roles which require military officers to be heavily involved in government. Non-democracies have military officers in national cabinets at more than three times the rate of democracies. Most democracies have no military officers in cabinet-level positions at all. Those that do — for instance, Afghanistan and Indonesia — have usually just emerged from long periods of dictatorship or war. Mattis would be the first former general to serve as defense secretary since George Marshall (1950-51). It’s certainly true that Gen. Mattis is almost universally respected in both the civilian and military spheres. Nevertheless, putting a former general in the office of defense secretary challenges the long-standing democratic principle of civilian control of the military. Consider also the potential appointment of Gen. Kelly as secretary of homeland security. For the first time in U.S. history, a former general would hold the cabinet position most focused on domestic security. The Department of Homeland Security oversees several federal law enforcement agencies, border protection, and the Coast Guard. Kelly’s appointment would erode the barrier that most democracies place between military elites and domestic security and law enforcement. Having a current or former military officer in this role is extremely rare in democracies. What are the implications of an increased reliance on generals? The answer, of course, depends on the disposition and political leanings of the general in question. Gen. Flynn has advocated a much more bellicose approach to foreign policy than the Obama administration. However, the research suggests that U.S. military officers generally are more reluctant to use military force than civilian officials — but more likely to favor escalation to higher levels of force once hostilities have begun. Research also shows, however, that when high-level positions in the government are shared by civilian and military elites, strategic decision-making suffers and the likelihood of mistakes increases. That comes in part because of unclear roles for civilian and military institutions in the chain of command, and could increase the potential for war. Here’s what’s more important. In other democracies, when the military is invited into traditionally civilian roles, it’s historically been followed by broader democratic failure. In fact, the military has often been brought into politics during periods of polarized civilian politics, like the one the U.S. is facing now. For instance, in Brazil, the long period of military rule (1964-1985) began when a substantial number of right-wing civilian politicians brought the military in, seeing it as an ally against the socialist policies of the left. On the other hand, the U.S. military’s institutional culture is not organized around seeking political power. The principle of civilian control is well-established and widely respected. In its more than 240 years, the U.S. military has never attempted a coup. As recent research has shown, institutional norms of civilian control strengthen over time. What’s more, most scholars agree that militaries that are involved in conflicts abroad — as is the U.S. military — are less likely to be interested in or able to accumulate political power at home. However, even long-standing norms can change — and the incoming administration has pledged to throw out many. Whatever the good intentions of the former officers who’ve been nominated, having a host of former generals in traditionally civilian positions would begin to erode principles of civil-military relations central to democracy, including civilian control and the political neutrality of the armed forces. Many failed democracies can testify that these are vital principles to hold on to. Peter White is a postdoctoral researcher at the Center for International Development and Conflict Management at the University of Maryland whose research has been supported by a National Science Foundation Dissertation Improvement Grant. The views expressed here are his own and do not reflect those of the NSF or the U.S. government.